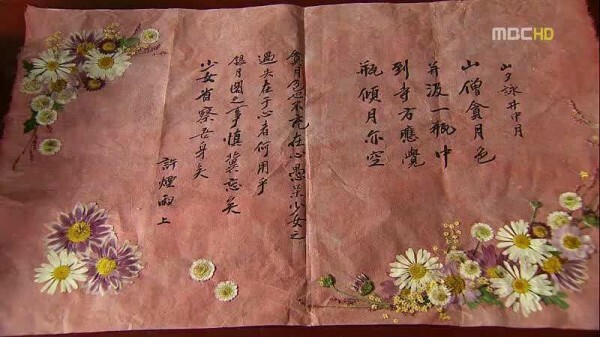 In episode 2 of The Moon that Embraces the Sun (The Sun and the Moon), Heo Yeon Woo wrote a poem for Lee Hwon. The poem is actually “The Moon in a Well” (咏井中月 or 山夕詠井中月) or in Hangul, 산에서 저녁에 우물속 달을 읊다. It’s a peom of the kind of five-character quatrain. The poem of The Moon in a Well is a beautiful poetry by Yi (Lee) Gyu-bo (이규보 / 李奎報) who lived between 1168-1241, during the Goryeo (Koryo) dynasty, who served in a variety of high-ranking local and central government posts after he passed the civil examination during the reign of King Myeong Jong in 1189. Here’s The Moon in a Well (詠井中月) poem in its entirety, with Hangul equivalent. Draws water with it into a carafe. Tilting the jar, the moon be gone as well. The poem basically portrays the desire of human being which is illusory.